St Giles School in Derby has achieved IQM Flagship School status. 1. To consolidate and embed the work of the Family Support Team, meeting the needs of individual families. This will include: 3x yearly themed tea parties, family homework, family homework workshops. 2. To further develop the school’s global curriculum giving further opportunities for all staff and students, Increase links with International schools (work towards the International School Award). 3. To continue with targets from 2016-17 on assessment without levels: to collaborate with a range of other specialist and mainstream and other stakeholders on how to assess pupils’ learning. During my visit I was also able to meet with the IQM Coordinator, Deputy Head and the member of staff with direct responsibility for Target 3. In addition to the submitted documentation, the school also provided photographic evidence (target 2) and further hard copy details for targets 1 and 3. •	Family clinics (sleeping, toileting). •	Family tea parties (very well attended). •	Monitoring behaviour and attendance. The school now produces a newsletter with dedicated sections for families. Communication with families has also been developed using a wide variety of systems – Class Dojo, Parent mail, Head Teacher blog, School website, Twitter and Facebook. Parents have also been included on recent school trips. This is a further innovation, which has helped to improve the numbers of parents/families taking part in school activities. The school now offer a pickup service for parents unable to make the journey to school. The school has certainly increased its input towards developing target 2. The whole “Global Learning” focus is now embedded throughout the school curriculum with activities including: World Food Day, Africa Day. Working towards “International School Award” (British Council). Direct links with schools in France, Finland, Sri Lanka and recently, a school visit to the established link school in Kenya (donated resources etc to the school). This has resulted in staff/parent links, emails to and from school, news and pen pals. The whole global learning initiative has raised the awareness of pupils and their parents regarding Global Sustainable Goals and Care and Well Being. The school continues to raise funds through community projects (car washing, drama productions, litter picking) and has now formed a link with Darley Dale School in Matlock, working collaboratively on a Global Education programme. 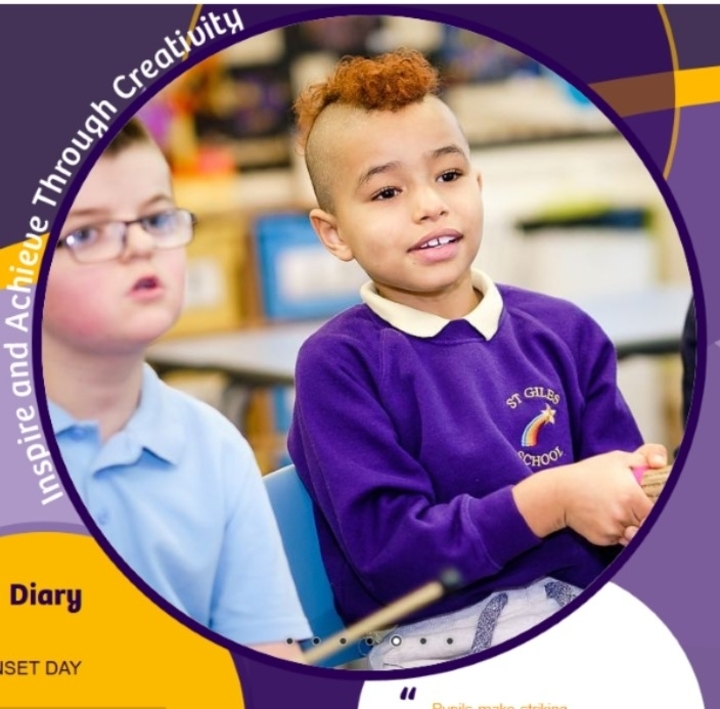 Target 3: Along with 55 other schools (including 8 teaching school hubs) across the UK, St Giles has been involved in a pilot looking at the 7 indicators: cognition and aspects of engagement. It has linked with 2 local schools (Ivy house +1) and has also won a representative place on the DFE Rochford review of SEND. St Giles has also undertaken a review of SEND provision in a mainstream secondary school. 2. CPLD (Mentally Healthy Schools). As with previous Centre of Excellence reviews, the school has demonstrated its total and ongoing commitment to Inclusive practice. Not only has the staff managed to maintain their high levels of expertise in delivering an exceptionally high quality of teaching and learning in the school, they have also demonstrated their capacity, success and creative practice to engage in all areas of the agreed targets from 2017.